iLoveToCreate Blog: 4th of July Platter - and a Sprinkles Cupcake Giftcard Giveaway! 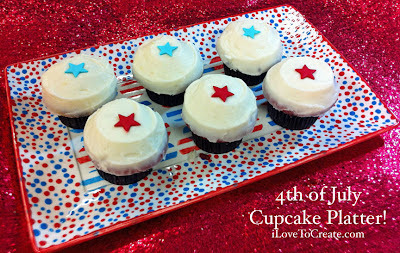 4th of July Platter - and a Sprinkles Cupcake Giftcard Giveaway! 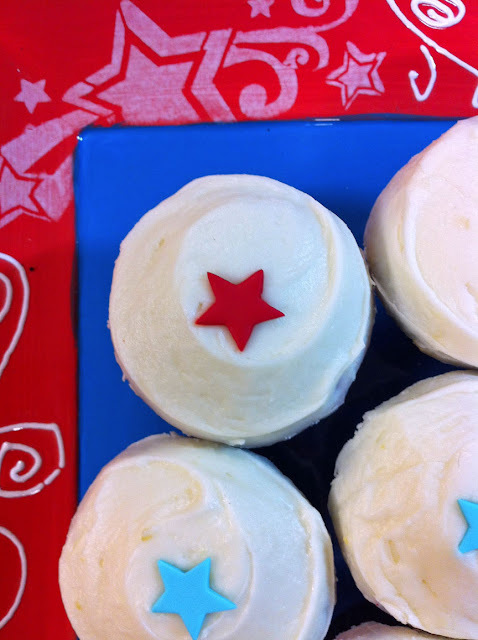 4th of July cupcakes courtesy of Sprinkles. The 4th of July is only a week away, but it's not too late to make some snazzy platters to hold your goodies. 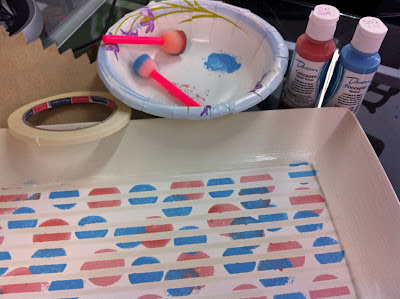 Here are two ideas of plates to create at your local paint-on-pottery shop! Special thanks to Sprinkles for donating the cupcakes for the photo - check the bottom of this post to enter in a giveaway! You'll need to select some Duncan bisque, I went with an oblong platter and a large square one. And then you'll need Duncan Concepts Underglazes in red, white and blue. Brushes and Pure Brilliance Glaze are needed too. You can find all the product details here. 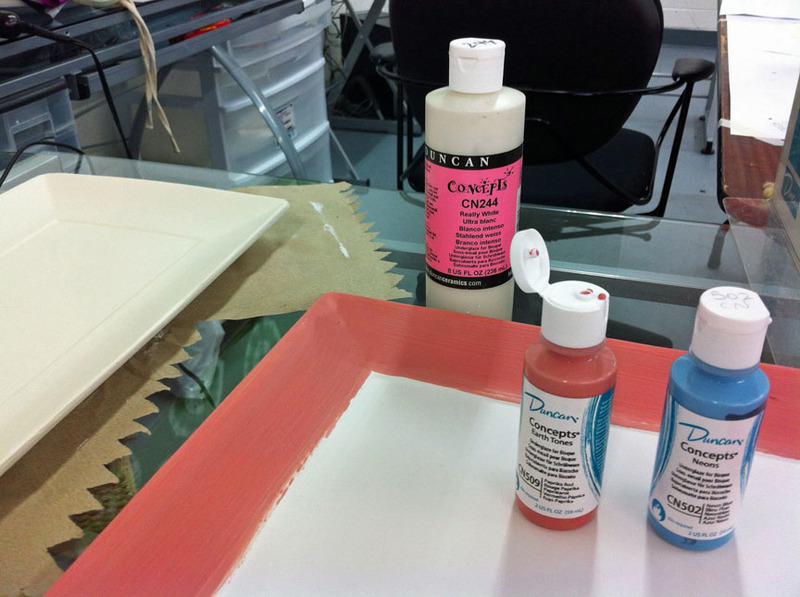 Base coat your platters as desired. I went with all white for one of them, and red and blue for the other. The contrast is nice once they are fired, they'll compliment each other! I used thin tape down the center of the platter and then used a Tulip Sponge Pouncer to create dots. For the outside, I used the tip of the paintbrush and made a hecka lot of polka dots! 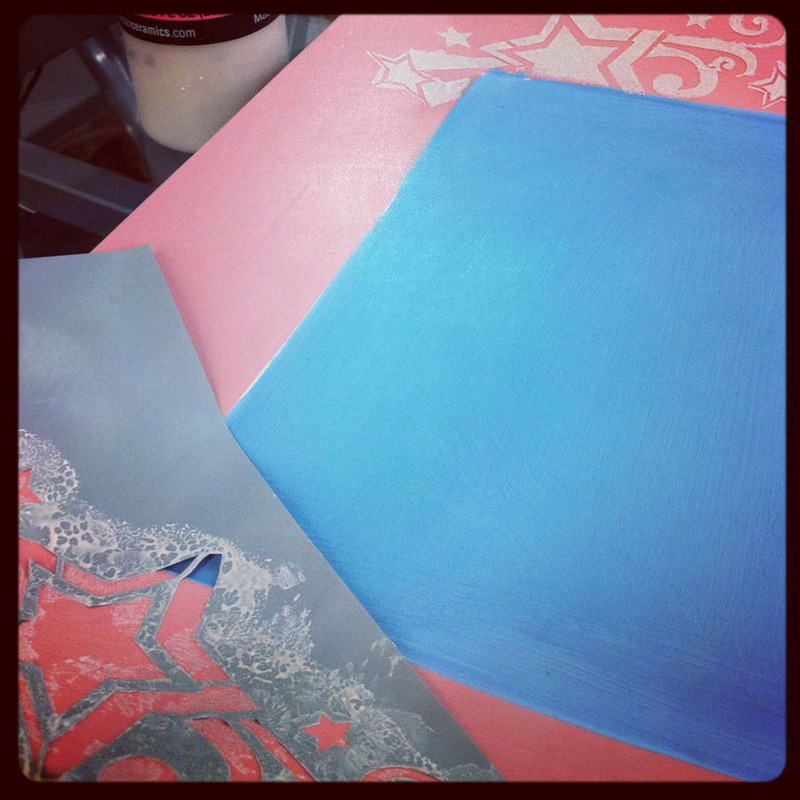 For the second platter, I used a Tulip Flexible Stencil and applied white paint with the pouncer. When you're finished, coat with two layers of Pure Brilliance and then fire at Cone 6. GIVEAWAY: Leave a comment sharing what you'll be crafting up for the 4th of July and we'll draw one name on Friday to win a $20 gift card to Sprinkles Cupcakes! My sister's birthday is the 4th of July and besides making her cake I am making a rag wreath in red white and blue bandana piece. I'll be making peach cobbler. I'm making red, white, & blue cupcakes for work! I don't know if I'm making anything to be honest. I have to stay home with my dogs due to the fireworks issues; I don't dare leave them alone. Everyone we know will probably be having their own cookouts and/or clambakes on the Cape. I am hoping to get to the parade in town though! Always make a special BBQ with Family. But I will be crafting and working on about 2 dozen mini scrapbooks for upcoming family reunion in middle of July. So, on july 4th my family will go through all old photo's to put in those mini books. Looking forward to seeing everyone at the reunion. Festive Firework Centerpieces!!!! Ill be using the cardboard from finished rolls of papertowels.... I want the table my BBQ and other goodies are served on to sparkle and pop! Mmmmm BBQ! I will be making myself a pair of red whit blue Swarovski earrings to wear to the family BBQ at my in laws! My sister in law is in from NY & has only seen my youngest a handful of times. I'm going to make the flag cake with blueberries, strawberries and fresh whipped cream. It's my favorite way to eat fruit! It would be a fourth of July parade complete with fireworks in my mouth! I 'm making walnut brownies! I'm planning to make a banner for a brewery that I work at. الحيرة من خلال الضمانات والمميزات التي سنسردها لكم والتي ستجعلكم تميزون بين الشركات ذات المصداقية والشركات التي تجعل من أوليتها الربح المادي فقط والشركات التي تعتمد على طرق غير فعالة، شركة مكافحة نمل أبيض بالرياض هي شركة ذات مصداقية تقدم خدماتها بجودة وكفاءة عالية من خلال التقنيات التي تستخدمها لمكافحة النمل الأبيض وكذلك سرعتها في الاستجابة لطلبات عملائها الكرام مع مراعات امكانياتهم المادية وحتى نقربكم أكثر من خدمات شركة مكافحة نمل أبيض بالرياض لتلمسوا مدى مصداقية الشركة ونجاحها في هذا المجال سنعرفكم على النهج والوسائل والمميزات التي تتمتع بها شرمة مكافحة نمل أبيض بالرياض.